Dan Sandberg is currently President and CEO of Brembo North America, Inc., and is responsible for all of Brembo’s North American operations, including its OE Automotive Systems and Disc Divisions, as well as Brembo’s Racing and Performance, Aftermarket and Motorcycle businesses. Brembo North America employs over 600 associates and operates 8 manufacturing, engineering and/or sales facilities in North America, and is the largest subsidiary of Brembo S.p.A., based in Italy. Brembo is a global firm specializing in the design, development and manufacture of high performance and premium brakes and other performance products, employing over 8,000 employees worldwide. 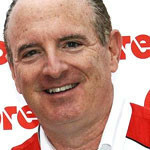 Prior to joining Brembo, Dan was President of the Automotive Components Group of Hayes Lemmerz International, Inc. where he was responsible for H-L’s $500 million brake, powertrain and suspension components businesses. He also held several other executive management positions at Hayes Lemmerz. Dan is a lifetime “Wolverine” receiving his Law and Undergraduate degrees from the University of Michigan, in addition to a Management Development Certificate from U of M’s Ross School of Business. Dan is also an avid photographer who loves to shoot anything that’s moving over 150 mph.